Don Quixote is travelling home following his first unsuccessful campaign through a desolate and barren evening landscape. 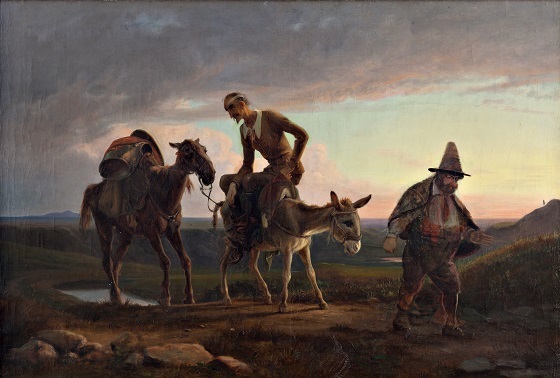 His faithful companion, the farmer Sancho Panza, talks to himself while guiding the beat-up knight’s steed – a donkey. Don Quixote is sitting in a contemplative position, most likely reflecting on a recent battle against some innocent travellers who he mistakenly believed had insulted his lady love, Dulcinea of Toboso. Marstrand liked to depict Cervantes’ tragicomic tale about the confused hero with a mixture of irony and compassion. It was particularly the overly optimistic and idealistic knight Don Quixote who was the object of Marstrand’s fascination.